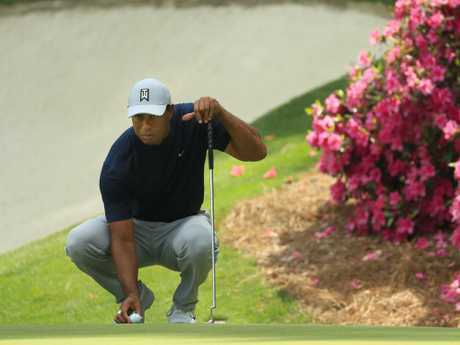 ADAM Adam Scott was for a while tied for the lead after completing his first round at the US Masters on a big day for Aussies, while Tiger Woods also produced a brilliant back nine to remind everyone of his ability to capture another major. Scott's place atop the leaderboard didn't last. He eventually slipped back to be tied for sixth at three-under, as Ian Poulter and Brooks Koepka made some big plays. Poulter ended on four-under after birdies on 15 and 16 but was soon overtaken by Koepka, who sank five birdies in six holes on the back nine to assume the lead at six-under. Three consecutive birdies to Bryson DeChambeau had the American sitting level with Koepka atop the leaderboard before a cruel, close call on the 18th prevented him from taking the outright lead. His incredible approach shot hit the flag and bounced back out to finish centimetres from the hole before he tapped in for a fourth straight birdie to end at six-under and cap a remarkable day. It was agony and ecstasy all at once for the world No.6. The near-miss came after DeChambeau almost aced the 16th but the 25-year-old would still be thrilled with his astonishing opening round 66 - his lowest round at Augusta. DeChambeau couldn't see what happened on 18 when his ball hit the flag stick and when he was shown a replay during a post-round TV interview, he threw his head back and laughed. "Oh my gosh, I guess I should have pulled the flag stick," DeChambeau said. Dustin Johnson jumped to four-under after birdies on the 13th and 16th and Phil Mickelson went on a late rampage to birdie five of his last seven holes to shoot 67 - his lowest first round score at Augusta since 201. He sits third on five-under. South African Justin Harding and Spain's Jon Rahm joined Scott on three-under after the opening 18 holes of the prestigious tournament and Woods finished the day one shot back at two-under par, as did Rickie Fowler. At 33, Harding is the oldest of 17 rookies in the field and surpassed his own expectations for his first-up performance. "It was good fun, I thoroughly enjoyed it," Harding said. "I handled the emotions of the day very well - better than I expected." Kevin Kisner and Kiradech Aphibarnrat also finished at three-under. Scott's fellow Australian Cameron Smith shot two-under and compatriot Jason Day showed tremendous grit to fight his way to two-under while battling back pain that required treatment as he moved gingerly around the course. Another Aussie, Marc Leishman, shot an even 72. A swashbuckling Woods crafted a remarkable recovery shot from the trees left of the 14th hole and drained a 7.5m birdie putt to join Harding (69) in a tie atop the leaderboard in Georgia before dropping a shot late in the day. 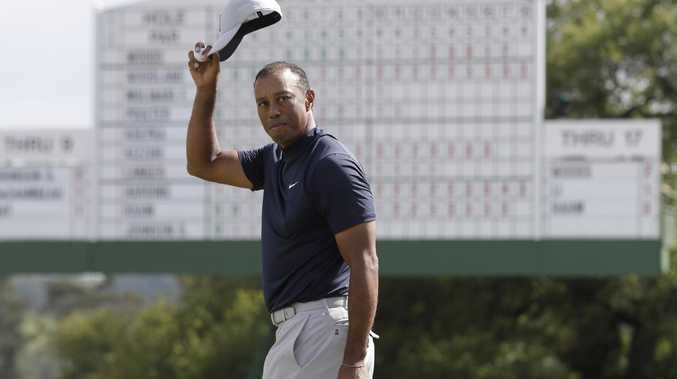 Woods, a four-time Masters champion, made the turn at one-under before hitting the green in two at the par-five 13th and two-putting for a birdie. Scott was treading water at even par through 14 holes but surged up the leaderboard courtesy of birdies at the par-five 15th and difficult par-four 17th. He then made it three birdies in four holes when he picked up another shot on the 18th. Day received treatment on his back beside the second hole but stood up from his early round massage and belted a 254m second shot into the par-five second and two-putted for birdie. Speaking about Day's condition, Scott said: "He seems to have a bad back all the time and plays great. So I'm sure he knows what he's doing." Smith bogeyed the first hole and also faltered on holes nine and 11, but bounced back with three birdies in the final six to finish two-under par. Canadian Corey Conners was the bolter of the frontrunners, finishing at two-under after becoming the last man to book his Masters berth. Conners rolled in a 5m eagle putt at the par-five 15th on the way to a total of 70 in the first major of 2019. He would have found himself tied for the lead if not for a bogey on the final hole. Rory McIlroy, who would complete a career Grand Slam with a victory at Augusta, had a disappointing day, finishing one-over as more big names struggled to tame the famous course. Jordan Spieth was well back at three-over, as was England's Justin Rose. American Phil Mickelson, who needs a US Open title to complete a career Grand Slam, was among those tipping McIlroy to contend for the trophy but the Irishman has a giant mountain to climb if he wants to add more silverware to his collection. "He's had such a phenomenal start to the year, been playing with such great consistency week-in week-out, I think contending will be a given," Mickelson said. "You just need those little breaks, little things to happen that push you over the winner's circle."